(From left to right): Anna Saum ’18, Lillian Alonzo ’20, and Leah Budson ’19 presenting their resolution at Plenary. Photo courtesy of Kate Silber ’20. At Fall Plenary, the resolution calling for a day of Collection passed after much debate. While many had concerns about quorum, campus jobs, and rescheduling labs, the biggest point of contention was the time the day ended. The resolution stipulated that Collection would end at four, ensuring that athletic practices could occur. 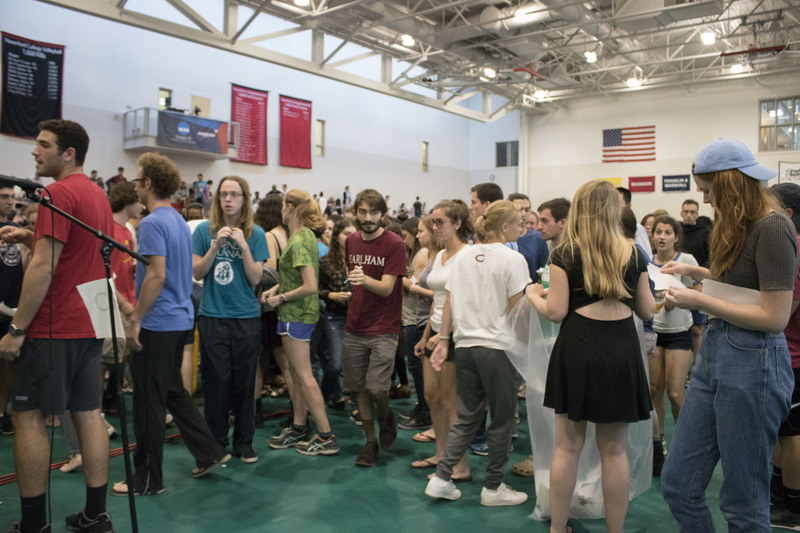 “It is basically considering sport practices more important than classes which is a really problematic, to say the least, value judgement for an academic institution to be making,” said Daniel Feshbach ‘20 computer science major. 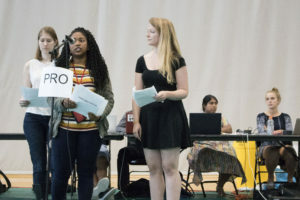 In response, Feshbach decided to draft an unfriendly amendment to the resolution which stated that athletic practices would be cancelled alongside classes. To Feshbach’s dismay, the amendment failed to ratify by only a few votes. “I think it says something really troubling about our community that we are saying that we are giving up a day of classes but are hesitant to give up athletic practices,” Feshbach said. It isn’t only Feshbach who thinks this. “It just made sense because if academic classes are cancelled why should athletic practices take precedence over that and why should we bend over for athletics?” said Hannah Yeakey ‘21 a member of the Women’s’ Cross Country team. Yeakey voted in favor of the athletic amendment. Anna Saum ‘18, one of the writers of the Collection resolution, revealed that the writers of the amendment originally wished for athletics to be cancelled as well. “But when we started talking to people—mostly people like the provost and Wendy Smith, who is the head of athletics—they basically told us that it was impossible to cancel athletics,” Saum said. Furthermore, when Saum and the rest of the resolution writers starting soliciting feedback, they learned that many student athletes were reluctant to give up practice for the day. “We really didn’t want to create a resolution that was doomed to fail [at] plenary,” Saum explained. “Furthermore, we felt that the absence of athletic activities during the day is not central to the purpose of the resolution. In considering different schedules for the day, we felt that it was not necessary for the day to continue past 4 p.m. We considered that many students—not just athletes—might appreciate a chance to resume their normal activities in between the end of Plenary and the closing celebration.,” Saum stated. Wendy Smith tells a slightly different story than Saum. “She came and said this is the way they are planning the day, planning on having it end at four o’clock so that students could do whatever they wanted. So it seemed like the schedule was already pre-done and we just talked a little about the difference between when in the year it might be,” Smith explained. Smith was shocked that the athletic amendment was even raised. “ I would assume that every activity would be cancelled similar to a snow day,” Smith stated.